Like a cold that you just can’t shake, supply-side economics enthusiasts just won’t go away. 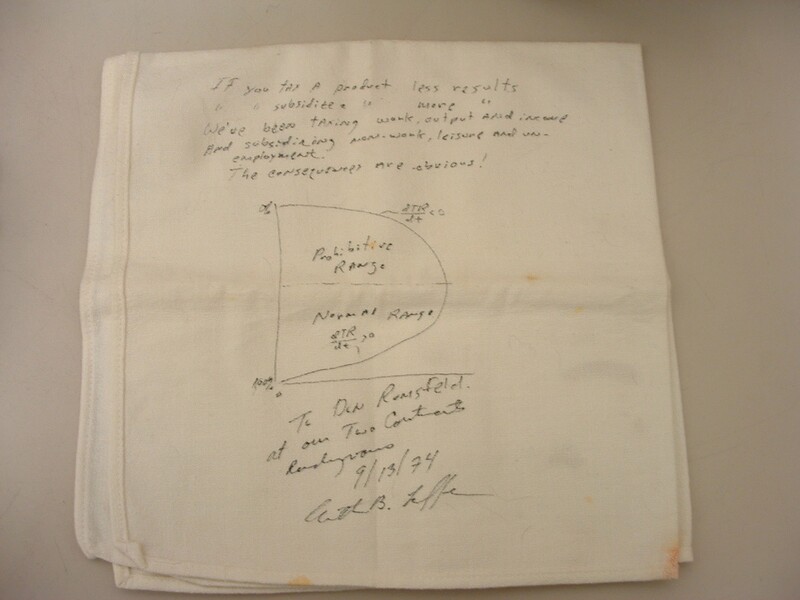 At a Joint Economic Committee hearing last Wednesday, economist Arthur Laffer, who first sketched out what’s now known as the Laffer curve on a napkin over 40 years ago, once again laid out the argument that massive tax cuts benefiting the wealthy lead to broad economic growth that “trickles down” to everyone else and offsets the cost of the tax cuts. In other words, tax cuts pay for themselves. History shows something else entirely: they don’t. In fact, over the past several decades, economic growth has often been faster when the top marginal income tax rate has been higher, not lower. But that hasn’t stopped those who worship at the supply-side altar. In 1993, Laffer predicted that“[President Bill] Clinton’s tax bill will do about as much damage to the U.S. economyas could feasibly be done in the current political environment.” History, that stubborn annoyance, of course proved otherwise. The U.S. economy grew much stronger during the Clinton years—when marginal income tax rates were higher—than during the George W. Bush years. This doesn’t mean that raising the top marginal tax rate creates growth and investment. However, it does mean that that lowering tax rates for the wealthy doesn’t automatically lead to faster growth and more investment, as the supply-side crowd claims. Most recently, Dr. Laffer and his conservative friends have applied their theories to Kansas. In 2012, he promised that tax cuts would create “enormous prosperity” for the state. Instead, the results have been disastrous. Significant tax cuts in Kansas have dramatically reduced revenues and left the state without the resources to fund its educational system. Job and GDP growth have also been weak—Kansas’ annual job growth has only been about half that of its neighboring states since the Laffer-inspired tax cuts were enacted. Apparently, some people think we never learn. The frontrunners for the Republican presidential nomination, Donald Trump and Ted Cruz, have each proposed enormous supply-side tax cuts. According to the Tax Policy Center, each of their plans would cost more than $10 trillion over 10 years in lost revenue and higher interest costs as a result of the increased debt created by those tax cuts. Meanwhile, they’d provide the average member of the top 0.1 percent a tax cut of well over $1 million per year. It’s like we’re stuck in a movie theatre and they just keep showing the same horror film with the same terrible ending. It is almost impossible for us to have meaningful tax reform, either incremental or transformative, until there is general acknowledgement that supply-side economics has not and does not work. It’s time to move beyond wishful thinking and focus on what has actually happened.